A small Anchorage company makes stylish and economical modern planters, delivered free to your front door. Portland is brimming with creative metalworkers but they rarely take on small projects, so it's often hard to find affordable metal planters with a modern aesthetic and clean lines. If you have a large-scale, sophisticated project to tackle, check out the gorgeous planters manufactured of anodyzed aluminum or steel by a local metal shop like Flux Design. But if you're just looking for a couple of planters, an off-the-shelf solution is probably your best bet. Yet buying cheap metal planters can be a mistake: when poorly welded, they can bust at the seams as the plants grow. If they aren't thick or strong enough, the sides bulge or bow when filled with soil and plants. The larger the planter, the more critical these issues become. A large mass of soil puts a lot of pressure on the sides of a flat-sided planter. And the larger the tree and root mass, the more of a hassle it is to replant if something goes wrong. Design Within Reach carries beautiful, large modern planters manufactured by the New York company Planterworx in two finishes: ever-popular corten steel or a glossy black, powder-coated aluminum. The planters have clean lines and come in three styles: the Thornton tapered planter, the Arena square planter and the Arena rectangular planter (basically, a trough). Prices range from $293 for smaller planters to $445 for the largest and are shipped in one, pre-assembled piece. Shipping is about $25-50 per pot to ship (comes to about 8% of the cost of the pot). A more economical and rather ingenious option is Nice Planter, a relatively new company in Anchorage, AK. Run by designer Dimitri Shein, the company's planters are manufactured by the Tarpenning-LaFollette Company Indianapolis, Indiana and also come in corten steel or powder-coated aluminum in a range of bright (emerald green, tomato red or bright orange), glossy finishes. Something is lost in translation with the name (the word "nice" is usually how we describe things when we're trying to be polite) but don't let the name fool you. The price is right, too: corten planters range from about $99 to $299, depending on size, with free shipping (some assembly is required). The website is a work-in-progress, but the product outshines the website. Nice Planter's planters are shipped in five interlocking pieces which are attached with bolts (included). Realistically, it takes two modestly adept people about 15 minutes to assemble the pieces. As with the DWR pieces, the wall and base thickness is 1/16th of an inch, which is pretty sturdy. The bases are pre-drilled with four ample holes so, once assembled, the planters are ready to go. (The website recommends putting empty plastic bottles in the bottom of the planter for "drainage" - we suggest using Packing Pearls instead.) Drain trays can also be purchased for many Nice Planters, and there are two raised track legs so the pots stand about a half inch high for better drainage. 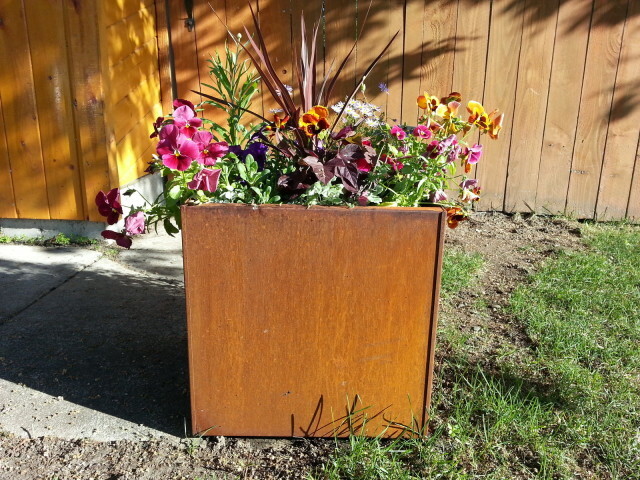 Nice Planter's corten planters are beautiful but they are also substantial, strong and oh-so reasonably priced. Add the fact that shipping is free and fast, and you have one very economical and stylish metal planter, delivered to your door by UPS. While they are American-made, neither Planterworx or Nice Planter's pots are made here in Portland, OR. But until we have our own quality, local, off-the-shelf metal planter manufacturer here in Stumptown, these handsome modern metal planters can provide stylish homes for your plantings.